Polaris UI Free is a set of beautiful free UI components, which includes Edit Boxes, Check Boxes, Radio Buttons, Page Navigation, Menu, Buttons and more. Use this UI Kit in any of your projects, and even learn with it, by examining each component to see how it is put together. You can easily use these elements in your design, or create a new one. Polaris UI will be suitable for creating both a web design and a mobile design or applications. Components are made in Adobe Photoshop (PSD) using Shape Layers (Vector Elements). Therefore, you can increase or decrease the size of each element without any loss of image quality. You can use this UI Pack for free even for commercial project, consider it as a gift to you, our regular readers. Awesome work guys. Perfect colors. Hi there, thanks for sharing. very beautiful icons! Awesome work guys. Very nice! Ideal for a project I have in mind. Very nice, thank you Designmodo ! Wow. That’s a brilliant set! Thank you so much! Use this link and scroll in the bottom. That’s nice, but I don’t see the link for the UI set? Please check the bottom of post with link to Smashing Magazine. wow. really nice design. will there be a premium one with more content? Maybe yes… We need some time to decide. Says download, but no download link other than for the font? We added links to download fonts in archive. I can only find psd files – but I need svg or ai vector based files. Where do I find links to vector-files? 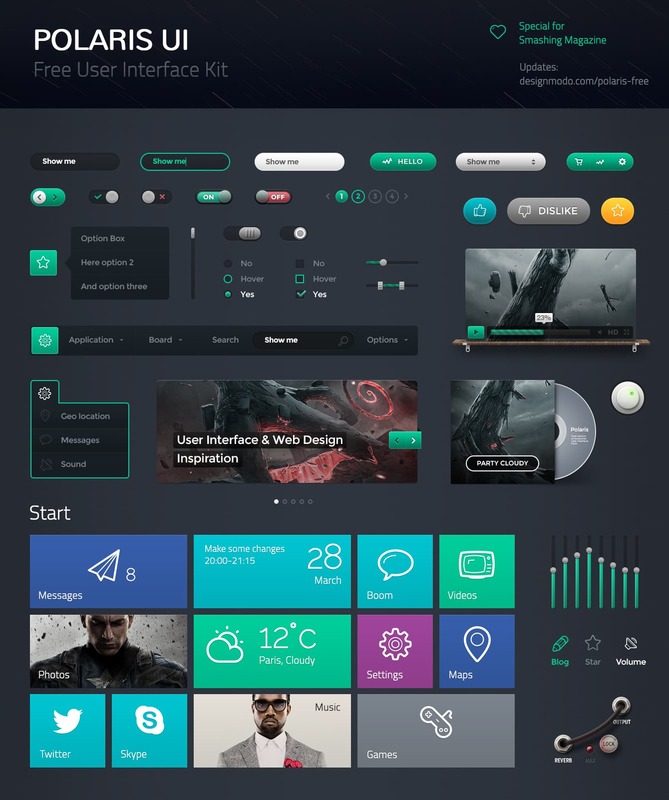 UI Kit is available in PSD format (vector layers). Icons (Linecons) is available in svg format + others formats, you can download icons from the same link on the Smashing Magazine. Good job guys, when will be available premium version of these ui kit with much more elements? Maybe we will make it, and for sure will be much more elements in the pack. Thank you for you interest! Immaculate set! Thank you so much! Awesome Work dude!! thank you so much!!! Thank you guyz! you’re awesome!!! This looks slick – well done. Love the colors. These look incredible, thanks so much for making them available for free. I really hope you see some paid love in return! Based on this quality, I’m sure I’ll be purchasing from you for future projects.